In a note to investors, Bank of America Merrill Lynch analyst Wamsi Mohan writes Apple is "working on a foldable phone," reports CNBC. Based on his meetings with several Apple suppliers in Asia, the analyst advises the device in question could possibly be unveiled in two years time. Mohan also suggests the foldable nature of the smartphone could give it another major selling point, as the possibility of folding a larger screen to a smartphone size means it "potentially double up as a tablet." In theory, such a device would give the benefit of a large-screened device like an iPad or iPad mini, but the portability of a smartphone. 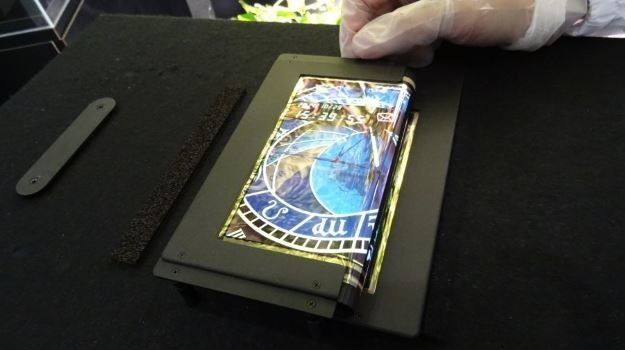 The suggested timing for the device's launch lines up with another report from October last year, with the claim LG has formed a "task force" to make a foldable OLED panel and a "rigid flexible printed circuit board" for a future iPhone model. That report also claimed production of the panel could start in 2020. Other smartphone producers have toyed around the concept of giving user the option of a larger screen, in a variety of different ways. Previous releases have typically involved the use of two separate displays and a hinge mechanism to fold the divided screen in half, like ZTE's Axon M, but this technique means the screen cannot be used as one cohesive display due to the noticeable gap in the middle. Major display producer LG has worked on the problem over the last few years, and has previously been rumored to collaborate with Apple on the concept. Samsung, another display supplier and rival smartphone producer, has teased its own concept smartphones using flexible technology in the past, but it is unknown if Apple is working with the firm to use the technology in any way. Apple has also filed for patents in the folding device field, including the "Flexible display devices" patent granted in 2016 that used a flexible OLED display with a hinged main body. Another application made in October for "Electronic Devices with Displays" depicts another version where a flexible section in the middle of the smartphone allowed the entire body to bend without seams or a visible hinge. In the same note, analyst Mohan suggests the lineup of iPhones expected this fall "to be largely unchanged for the OLED versions although size changes have proved to be a catalyst in the past." Recent rumors and reports indicate there to be three iPhones on the way, including two OLED-based versions with 5.9-inch and 6.5-inch screens, and a 6.1-inch model equipped with an LCD display panel. It is thought the larger OLED model could have lower specifications overall, with engineering samples allegedly using "lower-level specifications or lower capacities" than the LCD-based model, including reduced memory.